But Frank’s overly frank comments tend to annoy his friends and teachers. Not even his own mother is all that fond of Frank’s “tell all” attitude. “That used to happen to me, too,” said Grandpa Ernest. A few outrageous hats, a spicy jar of relish, and some grandfatherly wisdom help Frank realize that truth is best served with more sugar and less pepper. “Best Toenail Clipping” A while back I heard tell of a toenail-clipping scene in a picture book from John Schumacher on Twitter. A couple weeks ago I happened to come upon the scene he was talking about. An out-of-left-field moment. Frank believes that honesty is the best policy, but is that always the case? Elementary schooler Frank never lies to his schoolmates. He tells Dotty her freckles look like the Big Dipper, and he tells Carol her singing is “kind of shrieky.” Neither of them is pleased. Frank is also truthful with adults. He tells his teacher her breath smells; when sent to the principal, Frank tells him his toupee looks like a weasel. Even his mother doesn’t seem to appreciate his candor. No one in Frank’s life (including Frank) is happy, so he seeks help from his grandpa. Grandpa Ernest tells Mrs. Peacock he likes the purple flower in her hat best when she asks if he likes her gaudy chapeau. Frank thinks Grandpa has lied, but no: Grandpa only focused on the good things. Frank applies Grandpa’s advice to good effect and serves up the honesty with “more sugar… / and less pepper.” Earnhardt’s debut is a humorous object lesson in honesty, though the central punniness will be lost on the audience without some explanation. Italian illustrator Castellani’s blocky and bright Saturday-morning cartoon–style illustrations amp the wackiness and make this frankly fun. On-the-mark help for the parents of inadvertently tactless tots. Frank’s policy in life is “honesty is the best policy,” but when his unvarnished honesty gets him in hot water with his friends, his teachers, and finally, his mom, Frank begins to realize that others do not embrace his truthfulness in the way he might expect. A visit to his Grandpa Ernest’s and watching his very savvy grandfather respond to an out-of-this-world hat as well as a friend looking for advice on his relish helps Frank to understand that sometimes, we can be honest without being hurtful. Taking this new knowledge to heart, Frank is able to find a positive attribute in all of his friends and teachers and comment on those; he even manages to make his mom feel better by writing her a poem commenting on her “not so grey” hair. The illustrations are vivid and fit the dynamic of the book very well. This is a great book for younger readers as they learn more about how to interact with others in their lives with language use that supports good intentions. Whether children understand the titular pun on the word “frank,” they’ll understand the difference between the kind of frankness Frank starts out with (“Your singing is kind of shrieky,” he tells a classmate) and the kind he ends up with (“You sure can hit those high notes,” he says to the same classmate after a heart-to-heart with his tactful Grandpa Ernest). Newcomer Earnhardt makes her point with solid pacing and lots of laughs: “She knew how fast she was going,” Frank tells a police officer who’s pulled over his mother. “I told her.” Grandpa Ernest’s demonstration of diplomacy is low-key. “Well,” he says when a neighbor asks him about her gaudy hat, “there are an awful lot of flowers up there. But my favorite is the purple one in the middle.” Italian illustrator Castellani’s digital artwork is crisp, colorful, and energetic…. While Frank might not persuade sharp-tongued children to mend their ways, the story provides a useful array of good ways to deliver bad news. Ages 5–7. Frank says what he thinks. No one, from a “shrieky” classmate to his toupee-wearing principal, really appreciates his opinions. Even his mother, who speeds and has wrinkles, isn’t safe from her son’s unvarnished comments. With everyone angry with him, the boy begins to question whether honesty is indeed the best policy. He gets some sage advice from Grandpa and learns to tell the truth without hurting people’s feelings. 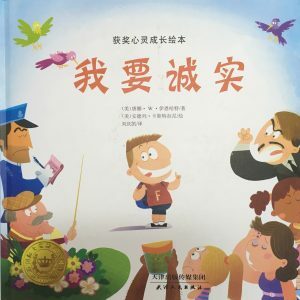 The quirky cartoon-style illustrations boost the entertainment value of this picture book, whose message is delivered with humor. Great for reading aloud and for discussions on being diplomatic. They say honesty is the best policy. And usually, it is. Except when you’re a little boy named Frank, the charmingly candid character in Donna Earnhardt’s debut picture book, Being Frank. This book had me in stitches! It had my kids laughing, too. From alerting his teacher of her non-minty breath, to confirming his mother’s speeding to the police; BEING FRANK is the only way Frank knows how to be. Luckily, a chat with his grandfather helps Frank understand it is okay to focus on people’s positives, instead of their negatives. While not easy at first, Frank surely learns that honesty goes best when sprinkled with more sugar … and less pepper! Frank is, frankly, too frank. He tells the brutal truth regardless of the consequences. He never lies, but he also never keeps quiet. He just puts his viewpoint right out there, much to the consternation of those he is evaluating. It’s his grandfather who teaches him the fine art of being honest while not being hurtful. Try to point out the positive. Only give a completely candid answer when asked for it. As he starts applying these concepts he discovers that honesty is, indeed, the best policy, but it’s best served with more sugar and less pepper. This is a delightful romp with colorful expressive illustrations by Andrea Castellani that make it perfect for group sharing. It would be sure to lead to good classroom discussion and would be a nice addition to units on social skills. Frank is aptly named (“Your singing is kind of shrieky”). Snubbed by his classmates and others, he turns to his grandfather, who demonstrates how to tell the truth “the right way.” The familiar premise is made wholly fresh by the book’s rampant humor, both textual and Photoshopped (Principal Wiggins’s toupie really does look, in Frank’s words, like a “pet weasel”). Oh, how I love this book! Frank truly represents all that is honest and charming and comical about kids…they say it like it is, oblivious to the adult phenomenon of social filters. Frank takes a lot of slack from people for simply saying things as he sees them. This is a challenge that we as grown-ups face. How do we teach our kids to be honest but only under the right circumstances? Or, how do we convey to them that lying is okay if it’s to spare someone’s feelings….is it? The purity of childhood makes them prone to black-and-white thinking. This book certainly touches upon this in a sweet and charming and yes, funny way. In this story, Frank’s grandfather can certainly relate and empathize with Frank’s predicament, and he teaches Frank how to use his honesty in a good way. Free from lying! What could be better? Frank’s grandfather not only helps Frank to modify his ways and improve his technique, but he can help us parents too, in handling this issue and perhaps save us from some potentially embarrassing moments. And, if the story isn’t enough, the illustrations are great. They’re fun and whimsical and suit the feel of the story. A perfectly balanced work! Enjoy this book! I know I do!! …This delightful and witty children’s book not only offers readers an artfully written story, but it is also a book that teaches children an important lesson about how to be polite when choosing one’s words. The text of this story is accompanied by lively and colorful illustrations that gleefully enhance the story…. Being Frank is a perfect book for reading out loud while a little one looks at the pictures. The vibrant, and at times quirky, illustrations in this book will also help encourage new readers to look through the book seeking out words they can decipher on their own. Best of all, the text is written in a large, dark print, making it an easy book to read for those who need or desire a larger font size. Even if you have perfect eyesight, you will find that the large print will allow you to read the book in the lower light setting that is often required when reading a little one to sleep! So curl up with this book and follow Frank as he discovers that by sugar coating the truth just a smidgen, you can be honest with people without hurting their feelings. This book provides a fun and engaging way to discuss a nuanced topic. I really appreciate the catch phrase, “more sugar less pepper” that is introduced in this book. Also, the illustrations are fantastic! …uses humor to teach kids that being brutally honest isn’t always the best policy. 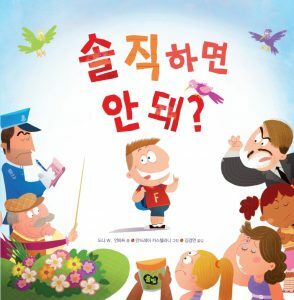 Kids on the spectrum often have problems with white lies and have a tendency to be too blunt….This book gently teaches the art of diplomacy and how to speak the truth with tact and love. …opens up opportunities for dialogue between parents and kids (especially kids with Asperger’s or a similar condition.) I can see the book being used to start conversations about “Hey, remember when you told that kid at recess he smelled funny?” in a way that is engaging and comfortable for the kid, or as a jumping off point for games like “Let’s say something in a rude way, and then figure out how to phrase it in a polite way.” I remember that during my own social skills improvement, it was a huge help that I felt like my parents were partners, instead of dictators telling me what to do. I think that Being Frank might be a great resource for parents to help them partner with their kids to work on social skills and tactfulness, instead of just laying down the law. If you’re a parent of a kid who struggles with social skills, or you know someone who is, check out Being Frank! Telling the truth is a good thing, but the method is sometimes more important than the content. 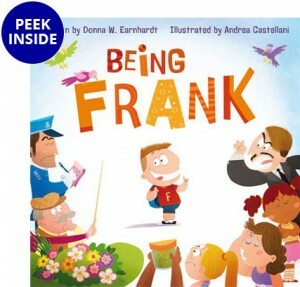 “Being Frank” is a children’s picturebook telling of overly honest Frank whose truthfulness gets him in more trouble than it makes him friends. With the guidance of his also honest grandfather Ernest, he learns to better serve his truth in life. “Being Frank” is a guide to good communication and how to use the power of honesty for the better, and the difference between honesty and rudeness. Frank by name and Frank by nature, this Frank is too honest! He believes that ‘honesty is the best policy’, but when he tells his friend Carol that her singing ‘is kind of shrieky’ and his teacher that her ‘breath smells funny’, they are not impressed. Mum is even less so when he tells the police officer that she was speeding! His friends reactions to his honesty make Frank sad, and he goes to find Grandpa Ernest, who also has a reputation for being more honest than is necessary. Grandpa explains that while one must always be honest, one can do it in ways that make people feel better about themselves. After Frank sees Grandpa’s ways of handling the truth, he learns the softer options – that the truth should be ‘served with more sugar and less pepper’. The comic-style pictures add to the fun. IMHO, Being Frank by Donna W. Earnhardt is frankly quite funny! Andrea Castellani’s bold and colorful illustrations would make this a great read-aloud choice for young children, especially those in grades K-2. …Being Frank is laugh-out-loud funny. The well-named characters and their true-to-life foibles could describe many of the people we know. The awkward situations in which they find themselves—being pulled over for a speeding ticket or asked an opinion about a very ugly hat—are humorous in their accuracy. The cartoonish illustrations add to the fun. When Grandpa tries Mr. Pickles’ overly spicy relish, for example, flames shoot of his mouth, his hair stands on end, and he drinks water straight from the hose. 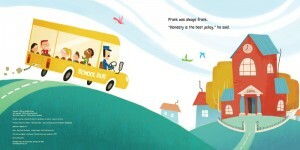 Being Frank teaches a lesson with humor and sincerity, making it a fun read for everyone. Third graders will appreciate the honesty of Frank regarding situations he finds himself in and will chuckle at the responses and illustrations. The story is a great read aloud for children who often don’t understand that there are tactful ways to approach and make comments to others without hurting someone’s feelings. This cute and captivating story demonstrates to kids how being brutally honest isn’t always necessary…. Follow Frank as he learns the balancing act of finding tactful ways to tell the truth in this relatable and comical tale. Earnhardt’s book is a thoughtful approach in teaching kids to always stay honest, but to be mindful of emotions and soften their approach. Frank is a little boy who believes honesty is always the best policy, so he says whatever comes to mind. But Frank’s subjective observations soon have everyone mad at him and he isn’t sure why. Frank turns to his grandfather, who has a history of brutal frankness himself. Grandpa Ernest soon shows Frank how to temper his subjectivity with kindness. I’ve known a few adults (including myself at times) who could benefit from Grampa Ernest’s wisdom! The bright, over-the-top illustrations do a great job of showing just how annoyed everyone becomes with Frank’s bluntness. A cute, quirky reminder for everyone that honesty and kindness can go hand in hand. After hurting his friends’ feelings one time too many because of his credo “Honesty is the best policy,” young Frank seeks out his grandpa for some advice. Fortunately for Frank, Grandpa Earnest has mastered the fine art of tactfulness and teaches his grandson exactly what it takes to share one’s opinion without hurting someone’s feelings. Not so easy, true. But it can be done. For example, when Mrs. Peacock walks by displaying her extravagantly plumaged new hat and asks Earnest if he likes it, he knows just what to say. “… there are an awful lot of flowers up there. But my favorite is the purple one in the middle.” So when Mr. Wiggins, school principal and toupee wearer dances at the school carnival what does the formerly insultingly honest lad say? “I see you have two left feet, sir?” NO! Not the new and improved Frank. “Impressive spins, sir!” remarks Frank. There are smiles and laughter all around that afternoon when, rather than repeat to Dotty that her freckles remind him of the Big Dipper, Frank tells his friend, “I like dots better than squares.” Clearly Grandpa’s lesson that frankness is best served with more sugar and less pepper has left a lasting, and sweet impression. Kids will agree the book has just the right amount of all the best picture book ingredients to make this one a keeper: great art, funny character names, clear and concise language and an important message about honesty. To leave a great taste in the mouth, serve carefully measured amounts. How often have you experienced the precocious and sometimes embarrassing “out of the mouths of babes” moments? This is a book that is loads of fun for both children and adults, while teaching the meaning and necessity of tact… Andrea Castellani’s illustrations are brilliant and add to the fun. Kids and parents will like everything about this book. The message is clear, there is lots of humor—including in the illustrations—and the advice from grandpa is great advice that we can all use…Being Frank is a good book for not only those kids who always tell the truth — even when it hurts— but also for those that do not like to tell the truth. My 10 year old son and I just read a delightful new children’s book, titled “Being Frank”. It was written by Donna Earnhardt and illustrated by Andrea Castellani. It is about a little boy who shares his opinions SO honestly that it hurts feelings and relationships. The book has a great message for adults training children with a knack for being a bit too frank. This was a BIG struggle for my daughter at age 4. I vividly (and with horror) remember her loudly sharing in front of the waiter “Mommy, he’s really fat.”, and in front of a woman at the pool, “Mommy, she’s not modest.”. And my 7-year old son told me last month, “You’re not good at telling jokes mom, you’re not very funny. You should just stick to talking.” All true, but definitely not shared with grace! Earnhardt offers a lovely and humorous way to talk with young children about being respectful and thoughtful while also being honest. She shares great examples of the good and bad ways to express your honest opinions. Daniel, age 10, says, “I like the book. It teaches you how to tell the truth, and it’s really funny.” This is a good resource for counselors to use in class. It’s good for parents and grandparents to read to children ages 4-8, and possibly even with middle school children. The website also has creative activity downloads to further enhance the lessons. A little discussion with his grandfather helps Frank learn about the difference between honesty and tact and how to still tell the truth without hurting people’s feelings…. Flashlight Press does a good job of creating picture books with messages that aren’t too heavy handed. 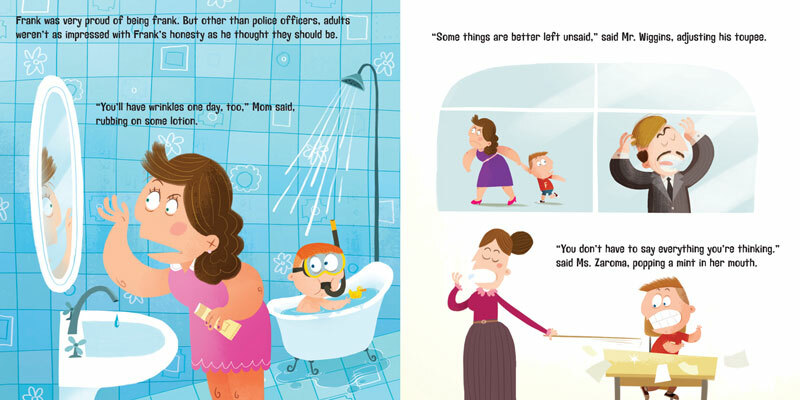 Perky digital illustrations and funny details will make this popular with parents who want to teach their kids the difference between honesty and tact. Frank is an elementary student who hasn’t quite learned yet that ‘you get more flies with honey.’ In fact, he lives so strictly guided by ‘honesty is the best policy,’ that his truth is often unkind and hurts the feelings of those he loves. Spewing his Frank observations, this little truth sleuth so upsets people in his world that he himself isn’t happy anymore. When he goes for advice, it’s Grandpa Ernest who teaches him how to filter his Frank thoughts and sprinkle the truth with tenderness. This newcomer is rich with literary treasures. Analyze the characters’ names. Why did the author pick Zaroma for the teacher who needs a breath mint? Why is the Grandfather’s name Ernest? What about Frank’s singing friend Carol? And his freckled friend Dotty? What other examples of names-that-fit can they find in this text? Talk about axioms. What is an axiom and what example(s) can they find in the book? What other axioms do they know? Finally, have them talk or write about a time when they had to cushion the truth with a little compassion and care. Check out this book and enjoy Being Frank! The illustrations are hilarious and for those with little ones, this story will definitely make you laugh out loud at how unfiltered our children can be at their young age. Great read! … a “must have” beautifully illustrated storybook with a moral presented in an entertaining way….believable and entertaining for children… a wonderful book to add to your bookshelf. When I get good teacher feedback, I know I’ve got a great one on my shelf. This is a social skills WINNER. Being Frank teaches kids the importance of THINKING before they speak…. Frank had a big impact on our students…. This book has breathed new life into some of my social skills lessons. It is a MUST. This is a great picture book with a wonderful message for kids…. The illustrations are unique, animated and colorful. They express the emotion of the story extremely well. I feel this book could be really helpful to Asperger kids. I don’t think that’s where the authors were going when they created the book but it’s what I see when I read it. It helps explain how that “frank”, comment, while honest and factual might not get you the result you’re looking for. Frank isn’t encouraged to lie, rather he becomes aware of how he could pick an honest fact that could keep both his integrity and the other person’s feelings intact. Hmm… Sounds like balance to me. Maybe we could all use a bit of that. 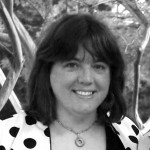 Donna Earnhardt is the author of Being Frank, illustrated by Andrea Castellani. When Donna isn’t homeschooling or battling the laundry, she’s writing children’s stories, poetry, songs, and mysteries. You might find her fishing the Pee-Dee River, hiking in the mountains with her family, or visiting her hometown of Cordova, NC. She lives in Concord, NC, and Being Frank is her first picture book. Follow Donna’s personal blog here. 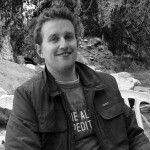 Andrea Castellani is the illustrator of Being Frank, written by Donna Earnhardt. Andrea (pronounced An-dray-a) is a founding member, as well as animator, director, and concept artist for Cartobaleno Animation Studio. He has won numerous awards for his animation and directorial talents at the Flashtoons Festival (2003), Visioni Animate Festival (2004), Valsusa Film Festival, Ionio Film Festival, Arcipelago Film Festival (2005), Ceccano Film Festival, and Cinematografare21 Film Festival (2006). His art has been exhibited at the Davico Art Gallery in Torino (2011) and at the Mitreo Art Gallery in Rome (2011-12). Being Frank is his fifth children’s book. Error: Error validating access token: Session has expired on Sunday, 23-Sep-18 01:36:16 PDT. The current time is Friday, 26-Apr-19 01:04:20 PDT.